This month in Bosnia-Herzegovina citizens protested government paralysis in every major city in the country, in some places leading to destruction of municipal government buildings. In Sarajevo, somebody took advantage of the chaos and burned the city archives – a terrible echo of the war of the 1990s, when the beautiful National and University Library was shelled by federal Yugoslav gunners and gutted, destroying the entire collection. Unfortunately, as events in Sarajevo demonstrate, the world’s cultural patrimony faces an array of threats less immediate but all the more dire and insidious for it. And we lack a coherent, coordinated ability to respond to threats to art and culture that measures up to the achievement of the monuments men. Today the Sarajevo Haggadah – the oldest Hebrew codex in the Balkans – sits in the National Museum of Bosnia-Herzegovina which has been closed for a year, unprotected. The Bosnian national parliament cannot agree on its status as a federal institution and refused to fund it. The Balkan Wars, both world wars and the wars of the former Yugoslavia could not shut down the museum, which until last winter had remained open for 125 years. This is only part of the reason why Bosnians are protesting. Without funding and support, professional curators and preservationists cannot ttend to their collections and artifacts. Climate goes uncontrolled. Collections are left unguarded and unmonitored. An entire nation’s patrimony is at risk. And Bosnia is not alone in Europe. Due to the financial crisis, the governments of Hungary, Bulgaria and Romania cut funding and closed many or parts of their national museums and galleries. Their collections, too, were threatened. Direct threats remain as well. When the Taliban destroyed the Buddhas of Bamiyan, they ripped out a part of the Afghan nation. When Ansar Dine extremists destroyed the mausoleums of Sufi Muslim saints in Timbuktu, they assaulted an ancient center of Islamic history and Malian identity. It is difficult to justify intervention on behalf of works of art, but it is impossible to say we won’t help restore them the way the Stare Most was rebuilt after it was destroyed more than 20 years ago in Mostar, Bosnia. But the United States today has no means, no unified institution and no philosophy – in short, no foreign cultural policy – to do what the monuments men did 70 years ago: to advocate on behalf of, preserve and, if necessary, rescue endangered art and culture around the world. What we have now in the United States is a hodge-podge of various agencies, bodies and private foundations – the Smithsonian Institution and National Gallery of Art, the State Department, USAID – each pursuing its own, limited projects without coordination, direction or support to match the need. Some of these projects are important and noble. For example, the Smithsonian moved rapidly after the 2010 earthquake leveled Port-á-Prince to rescue Haitian art. The Ambassadors Fund for Cultural Preservation provides flexible funding to U.S. embassies to support museums and galleries. But programs like these are small-bore or one-off. The Ambassadors Fund amounts to little more than $5 million per year for the entire world and only a fraction goes to securing the art works themselves. In my recent book, I proposed creating a public-private entity called the U.S. Arts Restoration Trust to coordinate government and private resources for the advocacy of art and culture around the world. USART would need to work with the State Department, because execution of these projects would by necessity be enabled through American embassies which have permanent personnel on the ground. And it would need to work with private foundations and galleries with the financial resources and technical know-how to help preserve and restore art in foreign countries. USART would represent, too, an ideological argument in our particular American approach to promoting art and culture. Culture in the United States is not entirely cut loose in the free market, but it is far more so than the rest of the world. American galleries and museums depend on philanthropy, particularly in contrast to their European or Asian counterparts. While the Smithsonian receives some federal funding, most municipal galleries and museums rely on local foundations and corporate charities. More precisely, we have a far deeper and longer history of philanthropy to draw on. When the European arts community was hit by the financial crisis, it was largely a recession of state support, and they had nowhere else to look for funding. As a result, their collections and personnel suffered. While traveling abroad I saw the Ma’il Qur’an at the British Library, one of the oldest copies of this sacred text in the world. 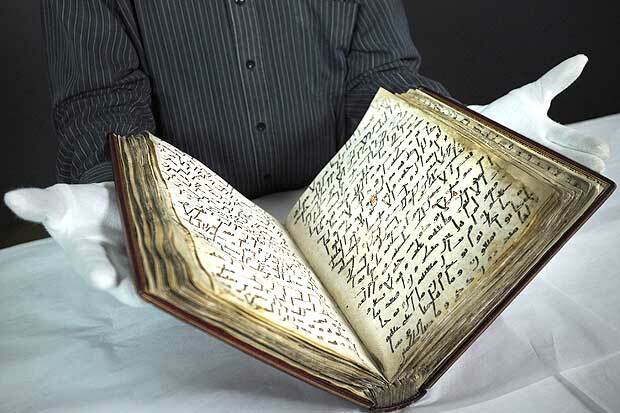 The importance of a library for preserving a codex becomes clear when you hear what senior conservator David Jacobs told the Arab News about the Ma’il Qur’an. “The problem with that particular manuscript is pigments that are quite friable and flaky, so obviously it needs care and attention and constant monitoring of its condition.” That kind of monitoring is no longer available to the Sarajevo Haggadah and possibly countless other irreplaceable texts and art pieces around the world. When viewing treasures saved by the monuments men or preserved in the British Library, it is impossible to imagine them not existing. But that is because they survived and are protected to this hour. Rescuing threatened art was a mission we assumed 70 years ago and it is a duty we should take even more seriously today. Gen. Dwight Eisenhower (r), Lt.Gen. 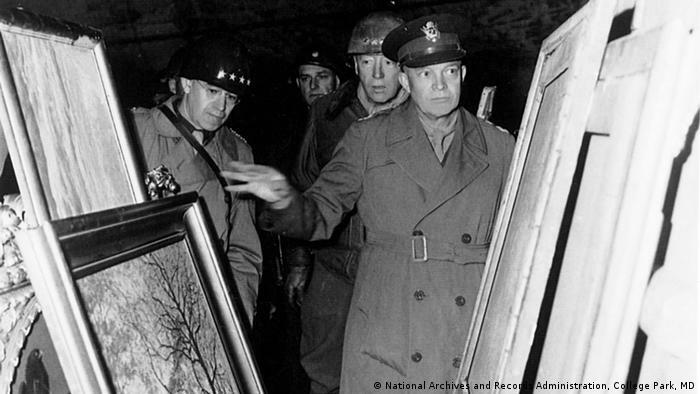 George Patton (c) and Gen. Omar Bradley (l), inspect art looted by the Nazis (NARA via DeutscheWelle). This entry was posted in Books, Public Diplomacy, The Former Yugoslavia and tagged aesthetics and politics, Afghanistan, Arab Spring, art, Art Galleries, BiH, Bosnia, current-events, EU, George Clooney, George Stokes, Islamic art, Ma'il Qur'an, Mali, National Gallery of Art, Public Diplomacy, Sarajevo, Sarajevo Haggadah, Smithsonian Institution, The Monuments Men, U.S. State Department, USAID. Bookmark the permalink. 1 Response to Do We Need A Cultural Foreign Policy? Seems to me that the role of world cultural protector falls under the aegis of UN / UNESCO. Couldn’t we / shouldn’t we be lighting fires under that organization?